Organic wastes, such as fats, oils, and grease (FOG), are good substrates for biogas production because of their high methane yield potential. 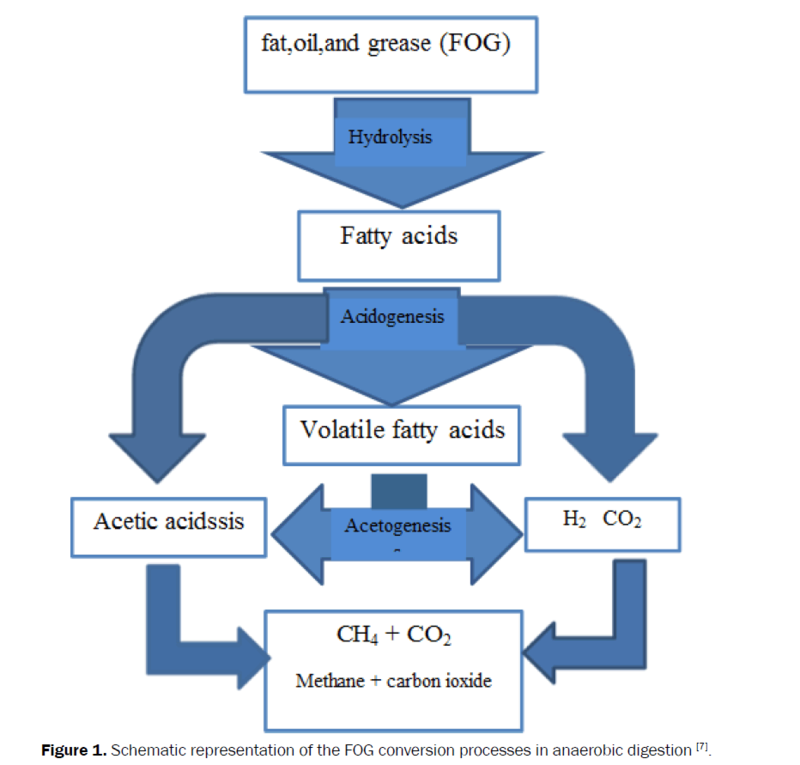 FOG are hydrolyzed to glycerol and long-chain fatty acids(LCFA), and the degradation of LCFA takes place through the β-oxidation pathway which has been reported as the rate-limiting step of the whole anaerobic digestion process. This paper reviews the scientiÃ¯Â¬Âc literature on LCFA and FOG anaerobic digestion, inhibition factors, and microbial community, and will highlight future research needed to improve the methane production of FOG by anaerobic co-digestion with other waste biomass. Organic wastes, such as fats, oils, and grease (FOG), are good substrates for biogas production because of their high methane yield potential. FOG are hydrolyzed to glycerol and long-chain fatty acids(LCFA), and the degradation of LCFA takes place through the β-oxidation pathway which has been reported as the rate-limiting step of the whole anaerobic digestion process. This paper reviews the scientiﬁc literature on LCFA and FOG anaerobic digestion, inhibition factors, and microbial community, and will highlight future research needed to improve the methane production of FOG by anaerobic co-digestion with other waste biomass. Fat, Oil, Grease (FOG), Anaerobic digestion, Long-chain Fatty acids (LCFA), Microbial community. The annual consumption of edible fat and oil was 2.1 × 107 ton, which consequently produced wasted oil about 6 ×106 ton in China. Anaerobic digestion (AD) was widely used at municipal waste treatment plants (WWTPs) and agricultural wastes biogas plants. Anaerobic digestion has been used for many decades to treat oily/fatty wastes, e.g., dairy wastewater , ice-cream wastes , fish waste , vegetable waste  and slaughter house wastewater . Lipids have been considered as a good feedstock for renewable energy production because of the high methane production potential (Table 1) . Theoretically, 1 g glycerol trioleate (C57H104O6) is equivalent to 1.08 L of CH4, and 1 g of glucose (C6H12O6) is equivalent to only 0.37 L at standard temperature and pressure. In practical AD reactors, 60%~74% of FOG was converted to methane. Table 1: Potential biogas production from different classes of substrates . Anaerobic digestion consists of a series of microbial process that convert organics to methane and carbon dioxide, and can take place under different temperature conditions, such as psychrophilic, mesophilic or thermophilic. Biodegradation under mesophilic conditions is most common. In general, anaerobic digestion can be divided into three major microbial steps, i.e. hydrolysis, acidogenesis/acetogenesis and methanogenesis shown in Figure 1 . Lipids are hydrolyzed to glycerol and long-chain fatty acids (LCFA), and then the degradation of LCFA takes place through the β-oxidation pathway which has been reported as the rate-limiting step of the whole anaerobic digestion process. During hydrolysis, a consortia of bacteria breaks down complex organics such as lipids from the influent into soluble monomers such as fatty acids. Hydrolysis of the complex polymers is catalyzed by extracellular lipases. Acidogenesis consists of fermentation and anaerobic oxidation (β-oxidation), which are carried out by fermentative acidogenic and acetogenic bacteria, respectively . Figure 1: Schematic representation of the FOG conversion processes in anaerobic digestion . LCFA toxicity: Treatment of FOG by anaerobic digestion is often obstructed because of the inhibitory effect of LCFAs. The early research showed that gram-positive microorganisms were inhibited at low concentrations of LCFA more than gram-negative microorganisms . Gram-positive methanogenic bacteria can be inhibited by LCFAs due to their cell wall . In UASB reactors, sorption of a light layer of LCFAs to biomass leads to the flotation of sludge and sludge washout . Koster and Cramer observed that Oleic acid have almost the same inhibitory as lauric acid, which exhibited I50 of 4.3 mM, and Caprylic acid was only slightly inhibitory . LCFA toxicity varied with the type of anaerobic sludges and was more correlated to the sludges’physical characteristics (specific surface area and size distribution) than to their biological characteristics. Suspended and flocculent sludges, which have a higher specific surface area, suffered much greater inhibition than granular sludge did . Thermophiles have been reported to be more sensitive to LCFAs than mesophiles, possibly due to the different composition of cell membranes . Biodegradation of LCFAs has been reported in both mesophilic and thermophilic environments [15,16]. It has been suggested that LCFAs exerted a bactericidal effect and no adaptation of methanogens occurred [15,16]. However, studies based on the degradation of oleic acid in an anaerobic fixed-bed reactor showed that acclimation improved the resistance of the biofilm in the presence of oleate and improved the biodegradation capacity compared to the biofilm formed in the absence of lipids [17,18]. Addition of calcium has been shown to reduce LCFA inhibition, probably because of the formation of insoluble salts [15,19]. However, calcium addition cannot solve the problem of sludge flotation. Long chain fatty acids inhibition: The lipids are neither easily treated by conventional means, nor decomposed biologically, due to the formation of insoluble aggregates and floating on the surface of the wastewater . Although lipid rich wastewaters have high methane potential, one of its intermediate products, LCFAs, can lead to inhibition [21,22]. Hanaki found that the addition of LCFAs caused the appearance of a lag period in methane production from acetate, and in the anaerobic digestion process. According to the Second Law of Thermodynamics, energy must flow from a higher to a lower potential. Thermodynamically acido-acetogenesis (fermentation) is endothermic and nonspontaneous (ΔG>0 and ΔH>0), and this implies that LCFA fermentation cannot proceed spontaneously, and that LCFAs form insoluble hydrophobic aggregates in the aqueous phase . However, acidogenesis together with acetogenesis decomposes the long chain saturated fatty acids to acetic acid through shorter chain fatty acids (β-oxidation) and by electrochemical coupling with methanogenesis. A strongly spontaneous process with a negative enthalpic driving force (ΔG<0 and ΔH<0) [23,24] occurs, and the non-spontaneous fermentation is thermodynamically switched to a spontaneous process (ΔG<0 and ΔH<0) . This implies that LCFA inhibition of methanogenesis could cause the failure of LCFA fermentation and the whole anaerobic digestion bioprocess. Severe LCFA inhibition was observed in an anaerobic membrane bioreactor for the treatment of lipid rich corn-to-ethanol thin stillage, and Dereli suggested that the extensive dissolution of LCFAs in the reactor broth possibly caused inhibition of methanogenesis . Inhibition of methanogens by LCFAs was reported as the limitation to exploit biogas production from fat-rich wastewaters . Inhibition by LCFAs during anaerobic processes depends on the type of LCFA, the microbial population, and the temperature. For instance, oleic acid, followed by palmitic and stearic acids, has been described as the LCFA with the greatest inhibitory effect on thermophiles . Mechanism of LCFA inhibition: Although LCFA degradation was suggested as the “limiting step” in methanogenesis due to its perceived limitations , by combining hydrolytic, fermentative, syntrophic acetogenic (SAB) and methanogenic microorganisms, anaerobic digestion of LCFAs has been achieved . The limiting step was suggested to be closely related to the initial concentration of LCFAs, and therefore high concentrations of LCFAs lead to the failure of anaerobic digesters [31,32]. It is believed that inhibition of anaerobic metabolism by LCFAs is attributed to the adsorption of the LCFAs onto the cell wall and affecting on membrane metabolic transport [33,34]. This adsorption delays methane production, but can be prevented by providing a competitive synthetic adsorbent (such as bentonite) , and the biophysics of LCFA inhibition in anaerobic digestion has been mathematically modeled . In addition, Hwu proved that the toxicity of a model LCFA (oleate) to acetoclastic methanogens in anaerobic sludge was not dependent on three biological factors (sludge origin, specific acetoclastic methanogenic activity and sludge adaptation to lipids), but was closely correlated to the physical factor of specific surface area of the sludge . Besides the inhibition of methanogenic bacteria, Pereira and Neves proposed that LCFA adsorption and accumulation on biomass can create a physical barrier and hinder the transfer of substrates and products, inducing an initial delay in methane production, and even causing sludge flotation and wash out [35,37]. Addition of calcium has been shown to alleviate LCFA inhibition, probably due to the formation of insoluble salts . Dilution of the reactor's content with inoculum, thus increasing the biomass/LCFA ratio, or the addition of adsorbents, was found to be the best strategies to recover thermophilic manure reactors subjected to LCFA inhibition . Co-digestion of FOG: As discussed previously, LCFA inhibition exists in the anaerobic reactor and cannot be resolved completely. Co-digest of FOG with other substrate became an effective and efficient method to resolve this problem. Numerous municipalities across the USA, Canada and Europe have implemented full scale anaerobic co-digestion of FOG and municipal sewage sludge at wastewater treatment plants . FOG or other high lipid wastes have also been successfully co-digested with cow manure, swine manure, and food waste [41-44]. Lab scale, pilot scale, and Full scale studies of co-digestion of FOG with municipal sewage sludge have been conducted across Europe, the USA, and Canada [45-54]. The results from above-mentioned studies show that the addition of FOG causes an increase in the gas production potential of the digester feedstock [55-57]. However, this gas production increases depend on the FOG loading rate, reactor configuration, mixing intensity, and possibly other variables. Kabouris reported an almost 200% increase in digester gas production [51,52] while Parry and Davidsson reported a maximum increase in digester gas production of 13% and 27%, respectively [43,48]. Microorganisms in FOG anaerobic co-digestion: FOG degradation in anaerobic bioreactors is accomplished by syntrophic communities of acetogenic bacteria and methanogenic archaea. Shigematsu and colleagues  used a 16S rRNA gene approach to study the microbial communities present in a chemist at fed with a mixture of oleic and palmitic acids. Members belonging to Syntrophomonadaceae were detected in the chemostat, although the most predominant microorganisms belonged to the Bacteroidetes and Spirochaetes phyla. The diversity and dynamics of biomass in reactors that treat saturated and unsaturated LCFA were studied by 16S ribosomal RNA genetargeted molecular techniques [59-61]. These studies revealed that the bacterial community of the sludges is quite complex. However, a significant part of the retrieved bacterial 16S rRNA gene sequences (53%) were most similar to those of yet uncultured microorganisms, with the majority assigned to the phylum Firmicutes. There are also members of Proteobacteria and Bacteroidetes were also found. Recently studies found that syntrophic β-oxidizing genus Syntrophomonas increased to ~15% of the Bacteria community in the codigester, and Methanosaeta and Methanospirillum were the dominant methanogenic genera . For a long period of time in the future, due to the inhibition of LCFA, the anaerobic co-digestion of FOG will still be the popular in china and global. Appropriate loading rate and microbial acclimation is the key to control LCFA inhibition. It is critical to understand the basis and mechanism of inhibition of LCFA, and design more suitable strategies to avoid LCFA inhibition in FOG anaerobic digestion. This work was supported by the National High Technology Research and Development Program of China (2013AA102805- 02) and Applied Basic Research Program of Sichuan Province (2015JY0054). Perle M, et al. Some biochemical aspects of the anaerobic degradation of dairy wastewater. Water Res. 1995;29:1549-54. Hawkes FR, et al. Comparative performance of anaerobic digesters operating on ice-cream wastewater. Water Res.1995;29:525-33. Achour M, et al. Design of an integrated bioprocess for the treatment of tuna processing liquid efluents. Process Biochem. 2000;35:1013-7. Li YY, et al. High-rate methane fermentation of lipid-rich food wastes by a high-solids co-digestion process; 2002. p. 143-50. Cuetos MJ, et al. Anaerobic digestion of solid slaughterhouse waste (SHW) at laboratory scale: influence of co-digestion with the organic fraction of municipal solid waste (OFMSW). Biochem Eng J. 2008;40:99-106. Alves MM, et al. Waste lipids to energy: how to optimize methane production from long-chain fatty acids (LCFA).Microbial Biotechnology.2009;2:538-550. Amaya OM, et al. Microbial biomass in batch and continuous system. biomass now-sustainable growth and use In: Darko Matovic Miodrag, editor. 2013. Batstone DJ and Jensen PD. 4.17- anaerobic processes. In: Wilderer P, editor. Treatise on water science. Oxford: Elsevier; 2011. p. 615-39. Kabara JJ, et al. Antimicrobial lipids: natural and synthetic fatty acids and monoglycerides. Lipids. 1977;12: 753-759. Zeikus JG. The biology of methanogenic bacteria. Bacteriol Rev. 1977;41:514-541. Rinzema A, et al. The effect of lauric acid shock loads on the biological and physical performance of granular sludge in UASB reactors digesting acetate. J Chem Tech Biotechnol. 1989;46:257-266. Hwu CS, et al. Comparative toxicity of long chain fatty acid to anaerobic kludges from various origins. Water Sci Technol. 1996;34:351-358. Hwu CS, et al. Acute toxicity of oleate to acetate-utilizing methanogens in mesophilic and thermophilic anaerobic sludges. Enzyme Microb Technol. 1997;21:297-301. Hanaki K, et al. Mechanism of inhibition caused by long chain fatty acids in anaerobic digestion process. Biotechnol Bioeng. 2004;23:1591-1610. Angelidaki I, et al. Effects of free long-chain fatty acids on thermophilic anaerobic digestion. Appl Microbiol Biotechnol. 1992;37:808-812. Alves MM, et al. Effects of lipids and oleic acid on biomass development in anaerobic fixed-bed reactors. Part I: biofilm growth and activity. Water Res. 2001; 35:255-263. Alves MM, et al. Effects of lipids and oleic acid on biomass development in anaerobic fixed-bed reactors. Part II: Oleic acid toxicity and biodegradability. Water Res. 2001.35: 264–270. Angelidaki I, et al. Effects of lipids on thermophilic anaerobic digestion and reduction of lipid inhibition upon addition of bentonite. Appl Microbiol Biotechnol. 1990; 33:469-472. Stoll U, et al. Management strategies for oil and grease residues. Waste Manag Res.1997;15:23-32. Palatsi J, et al. Influence of adsorption and anaerobic granular sludge characteristics on long chain fatty acids inhibition process. Water Res. 2012;46:5268-78. Hanaki K, et al. Mechanism of inhibition caused by long-chain fatty acids in anaerobic digestion process. Biotechnol Bioeng. 1981;23:1591-610. Oh ST, et al. Thermodynamic equilibrium model in anaerobic digestion process. Biochem Eng J. 2007;34: 256-66. Oh ST, et al. Long chain fatty acids degradation in anaerobic digester: thermodynamic equilibrium consideration. Process Biochem. 2010;45:335-45. Bartoschek S, et al. N-carboxymethanofuran (carbamate) formation from methanofuran and CO2 in methanogenic archaea. Eur J Biochem. 2000;267:3130-8. Dereli et al. Effect of sludge retention time on the biological performance of anaerobic membrane bioreactors treating corn-to ethanol thin stillage with high lipid content. Water Res.2014;49:453-64. Silvestre G, et al. Thermophilic anaerobic co-digestion of sewage sludge with grease waste: effect of long chain fatty acids in the methane yield and its dewatering properties. Appl Energy. 2014;117:87–94. Pereira MA, et al. Anaerobic biodegradation of oleic and palmitic acids: evidence of mass transfer limitations caused by long chain fatty acid accumulation onto the anaerobic sludge. Biotechnol Bioeng. 2005;92:15–23. Novak JT, et al. The kinetics of anaerobic long-chain fatty-acid degradation. J Water Pollut Control Fed. 1970;42:1932–1943. Summers R, et al. A detailed study of piggery-waste anaerobic digestion. Agric Waste. 1980;2:61-78. Chen YR, et al. Kinetics of methane fermentation, Biotechnology and Bioengineering Symposium, No. 8. Biotechnology in Energy Production and Conservation. In: Scott C, editor. Proceedings of the First Symposium. Gatlinburg, Tenn., USA,1978. USA: Wiley; 1979. p. 269–82. Tijero J, et al. Kinetic study of anaerobic digestion of glucose and sucrose. J Environ Sci Health A. 1989;24:297-319. Masse L, et al. Neutral fat hydrolysis and long-chain fatty acid oxidation during anaerobic digestion of slaughterhouse wastewater. Biotechnol Bioeng. 2002;79:43–52. Neves L,et al. Anaerobic co-digestion of coffee waste and sewage sludge. Waste Manag. 2006;26:176–81. Zonta Ž, et al. Modelling inhibitory effects of long chain fatty acids in the anaerobic digestion process. Water Res. 2013;47:1369–80. Neves L, et al. Co-digestion of cow manure, food waste and intermittent input of fat. Bioresour Technol. 2009;100:1957–62. Hanaki K, et al. Mechanism of inhibition caused by long-chain fatty acids in anaerobic digestion process. Biotechnol Bioeng. 1981;23:1591–610. Palatsi J, et al. Strategies for recovering inhibition caused by long chain fatty acids on anaerobic thermophilic biogas reactors. Bioresour Technol. 2009;100:4588-4596. Chung G, et al. Direct Addition of High-Strength Organic Waste to Municipal Wastewater Anaerobic Digesters. Water Environment Federation, Tech. Alexandria, VA. 2010. Zitomer DH, et al. Municipal anaerobic digesters for codigestion, energy recovery, and greenhouse gas reductions. Water Environ Res.2008;80:229–237. Neves L, et al. Fate of LCFA in the co-digestion of cow manure, food waste and discontinuous addition of oil. Water Res. 2009;43:5142-5150. Parry DL, et al. Codigestion of organic waste. In: Proceedings of the Water Environment Federation. 2009; pp. 210–229. Creamer KS, et al. Stable thermophilic anaerobic digestion of dissolved air floatation (DAF) sludge by co-digestion with swine manure. Bioresour Technol. 2010;101:3020-3024. Suto P, et al. Innovative anaerobic digestion investigation of fats, oils, and grease. In: Proceedings of the Water Environment Federation. 2006; pp.858–879. Bailey RS. Anaerobic digestion of restaurant grease wastewater to improve methane gas production and electrical power generation potential. In: Proceedings of the 80th Annual Technical Exhibition and Conference of the Water Environment Federation, 13–17 October 2007, San Diego, CA,pp. 6793-6805. Cockrell P. Grease digestion to increase digester gas production-4 years of operation. In: Proceedings of the Water Environment Federation. 2007. Davidsson A, et al. Co-digestion of grease trap sludge and sewage sludge. Waste Manage. 2008; 28:986-992. Kabouris JC, et al. The anaerobic biodegradability of municipal sludge and fat, oil, and grease at mesophilic conditions. Water Environ Res. 2008;80:212-221. Parry DL, et al. Making methane: co-digestion of organic waste with wastewater solids. In: Proceedings of the Water Environment Federation. 2008; pp.1045–1062. Kabouris JC, et al. Mesophilic and thermophilic anaerobic digestion of municipal sludge and fat, oil, and grease. Water Environ Res. 2009; 81:476-485. Kabouris JC, et al. Methane recovery from the anaerobic codigestion of municipal sludge and FOG. Bioresour Technol. 2009; 100:3701-3705. Luostarinen S, et al. Increased biogas production at wastewater treatment plants through co-digestion of sewage sludge with grease trap sludge from a meat processing plant. Bioresour Technol.2009;100:79–85. Muller C, et al. Co-digestion at Annacis Island WWTP: metro Vancouver’s path to renewable energy and greenhouse gas emission reductions. In: Proceedings of the Water Environment Federation. 2010. Martínez EJ, et al. Anaerobic Codigestion of Sludge: Addition of Butcher’s Fat Waste as a Cosubstrate for Increasing Biogas Production. PLoS One. 2016;11:e0153139. Wan C, et al. Semi-continuous anaerobic co-digestion of thickened waste activated sludge and fat, oil and grease. Waste Manag. 2011;31:1752e1758. Wang L, et al. Determining the limits of anaerobic codigestion of thickened waste activated sludge with grease interceptor waste. Water Res. 2013;47:3835-3844. Shigematsu T, et al. Microbial diversity of mesophilic methanogenic consortium that degrade long chain fatty acids in chemostat cultivation. J Biosci Bioeng. 2006;102:535–544. Sousa D, et al. Syntrophomonas zehnderi sp. nov., an anaerobe that degrades long chain fatty acids in co-culture with Methanobacterium formicicum. Int J Syst Evol Microbiol. 2007;57:609-615. Sousa DZ, et al. Molecular assessment of complex microbial communities degrading long chain fatty acids in methanogenic bacteria. FEMS Microbiology Ecology. 2006;60:252-265. Sousa DZ, et al. Ecophysiology of syntrophic communities that degrade saturated and unsaturated long-chain fatty acids. FEMS Microbiol Ecol. 2009;68:257-272. Ziels RM, et al. Microbial community adaptation influences long-chain fatty acid conversion during anaerobic codigestion of fats, oils, and grease with municipal sludge. Water Res. 2016;103:372-82.